These garden gates in Selborne, Hampshire were part of a larger project, where we were engaged to re-design a specific area that included the detailed design of a series of walls and gates. 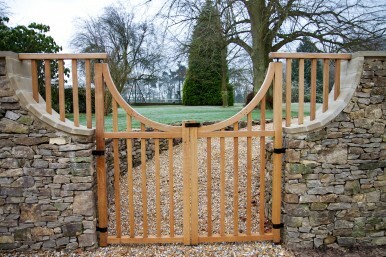 Taking inspiration from elements of the architecture and site, we had these bespoke gates made locally. New air-dried oak was used for the creation of the garden gates and we even re-designed the hinges, which were also made at a local metal fabrication workshop to complete the look the client required. These high value materials were specially commissioned and produced and our skilled team installed these with care and professionalism.